HAYS, Kan. – Bailey and Brody Lewis didn’t have to wrestle very hard with the decision of where to attend college. The youngest siblings of a close-knit farming family from south central Nebraska, Bailey and Brody trusted what other family members had been learning for four generations – that Fort Hays State University was the right fit for them. Now, Bailey and Brody think so much of FHSU – and its wrestling program – that they stayed in Hays last weekend rather than head home for their favorite time of year: calving season. The Lewis siblings, in their first year at Fort Hays State, decided to help work tables at the Class 3-2-1A State High School Championships at FHSU’s Gross Memorial Coliseum. 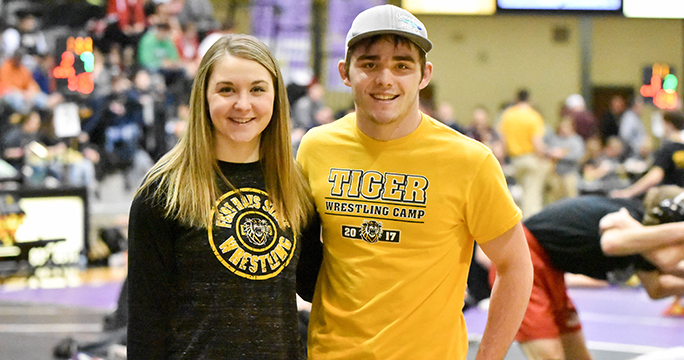 Brody, a freshman who wrestled some varsity matches for the Tigers this season, and Bailey, a junior who served as one of the FHSU wrestling team managers, jumped at the chance to be around their favorite sport and to experience the difference between state tournaments in Kansas and their native state. The Lewis siblings – children of a long-time high school wrestling coach in Nebraska – have been around the sport their entire lives. Over the years, the Lewis family saw a lot of quality wrestling in Century Link Center Omaha, home to the state prep wrestling tourney for all four prep classifications. After watching their dad’s teams compete at state for several years, Bailey and the rest of her family then got to cheer on Brody, who qualified for state all four years of his high school career. Both Bailey and Brody enjoyed Kansas' version of high school state competition, too. Bailey served as manager of her high school wrestling team all four years and was a talented athlete herself. She attended Cloud County Community College in Concordia on a volleyball scholarship for two years and knew she was going to transfer to FHSU this year. Following a stellar high school wrestling career highlighted by two state championships and a runner-up finish, Brody said he was strongly considering FHSU. Then a scholarship offer from Tiger wrestling coach Chas Thompson confirmed the deal. “I looked at some options, but Fort Hays State was a school I had been to before with my parents and sisters, and I really liked the way the school is set up,” said Brody, a four-time state qualifier who recorded a 153-16 career record at Franklin High School. Following both his older sisters to FHSU seemed as natural a family tradition for Brody to keep as wrestling. Oldest sister Brittany also attended FHSU right out of high school. Brittany, now married with a family and living back home, is taking online courses through FHSU to finish her degree in elementary education.  The Lewis family connection to Fort Hays State goes back a lot farther than that, though. The Lewis siblings’ parents, Aaron and Brook, were high school sweethearts from neighboring towns in Nebraska and came to Fort Hays State together. They graduated in 1995 and 1997, respectively – Aaron with a degree in agriculture business and Brook, elementary education, then returned home to Nebraska to raise their family. Decades before that, Aaron’s maternal grandmother, Ruth Glover from Jewell County, attended FHSU in the 1940s and received her normal training for a teaching certificate. Aaron’s paternal grandparents, Kenneth and Dorothy Lewis, also attended Fort Hays State and received their degrees in elementary education in 1963. While wrestling will always be a part of Bailey’s and Brody’s lives in one way or another – their 4-year-old nephew, Gracin, already is competing – they also have set the bar high for their career goals. Bailey is an accounting major with aspirations to become a CPA. Brody is an animal science major in the pre-vet program. He plans to earn his bachelor’s degree from FHSU before applying for veterinary school at a larger university. Both Brody and Bailey are also involved in other ways on campus. Brody is part of the “Athletes Today, Leaders Tomorrow” Learning Community and also helps run the chute for the rope typing events for the FHSU rodeo team practices. Bailey works in the admissions office on campus, where she serves as a student ambassador and gives campus tours to potential students and their families. She learned just recently that she has been chosen to serve as a New Student and Family Orientation Leader. That group staffs pre-enrollment sessions for freshmen and transfer students during the spring as well as Tiger Impact Fall Orientation Weekend during August. The Lewises have found there are several benefits of siblings attending the same university. They eat lunch together on Tuesdays and attend a church group on Wednesday evenings. At least one weekend a month, they travel home together to help out on their family farm. “It’s nice to have someone to ride home with you,” said Bailey, who lives in an apartment near campus with some other former Cloud County teammates. Cutline: FHSU wrestling team manager Bailey Lewis, left, and her younger brother, Tiger wrestler Brody Lewis. Photo credit: Ryan Prickett.